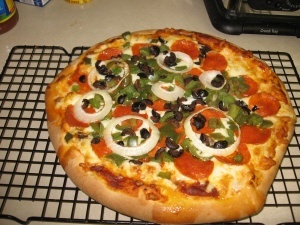 This is a recipe for a pepperoni pizza but the quick and easy procedure can be used to make any flavor pizza you like. Let your imagination be your guide. For ideas, see the list of toppings and pizza trivia that we have collected over the years. Use your own favorite spaghetti sauce or prepared pizza sauce.Requires about 1/2 cup of sauce for 12 to 14-inch pizza. In bread machine, put water and salt into bottom of chamber then add flour and then yeast. Make dough using bread machine's dough cycle - about 1 1/2 hours. 8 to 10 String chees sticks if making stuffed crust pizza. I get to add sliced mushrooms to my half of the pizza. Theses are directions for a pepperoni cheese pizza but the choice of toppings is yours. Makes 1 12-inch medium crust or 1 cookie sheet thin-crust pizza. Crust can be made by hand if there is no bread machine to use. After dough cycle, or after dough has doubled when hand made, place dough on floured counter and knead until uniform and non sticky. For stuffed crust pizza, place string cheese lengths on crust around edge of pan and then fold overhanging crust and tuck under. For pan pizza, roll out dough in rectangular shape until there is about 1-inch overhanf and then proceed as with round pizza. Cover loosely with cloth or towel and set in warm area to rise. When the crust has raised to your liking, ladle the sauce over the crust dough to make a uniform layer.Spread out the cheeses to cover the pizza evenly. Sprinkle the green peppers and onions on top. Arrange the pepperoni slices over the top of the pizza. Note:If you put the peppers and onions in the sauce layer, they will not cook as much and be sharper in tatse. If they peppers and onions are placed on the cheese layrer, they will cook more fully and be milder in taste. Place the pizza in a cold oven and turn the temperature up to 450º. Cook for 20 to 45 minutes (depending on your oven) or until the crust is brown and the cheese well melted. If using frozen peppers and onions, allow to thaw on paper towel so that extra moisture is not added to the pizza to make it soggy. The instructions are for making a single pizza. 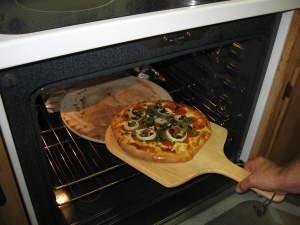 Most ovens wont adequately cook more than one pizza at a time - the crust comes out soggy. For a second pizza, cook in the already heated 450F oven for about 15 minutes or until the crust is nicely browned and the cheese is hot and bubbly. If using a pizza stone, follow the cooking instruction for a fresh pizza that came with your stone.